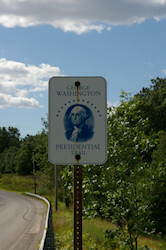 The George Washington Presidential Trail was created in 1989 by an act of the Massachusetts Legislature. 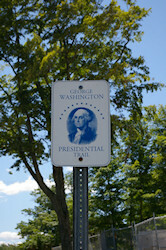 It commemorates Washington's trip through the Blackstone valley on November 6th 1789. Although the act only designates a 3/4 mile long section of Route 16 in Mendon, the trail and its signs were extended 5 miles down Hartford avenue into Uxbridge. To see the route of the trail in Google Earth download this places file I created. For a virtual trip along the trail turn on the street view layer, it covers the entire trail. Washington liked the countryside and roads but was clearly not impressed with Dorothy Coolidge's Tavern. The President's diary entry for the next day starts with the mileage tally for his route to the middle of the Blackstone valley. 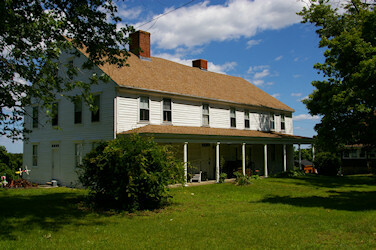 The route Washington describes starting at Dorothy Coolidge's Tavern in Watertown up to Mendon corresponds closely with the present day Massachusetts Route 16. On a modern map, Route 16 does not pass through Needham but in 1789 present day Wellesley was part of Needham. At either Holliston or Mendon (I've seen two different routes claimed to be the road) the President's route joined the Middle Post Road ending at Samuel Taft's house in Uxbridge. While it's likely that modern roads are not located exactly the same as the old roads, based on the travel distances they must be very close. Using modern roads it's 33 miles from Coolidge's to Taft's, Washington recorded 36 miles, that's less than 10% difference. I suspect that much of the difference is from detours to avoid the steeper grades on the modern route. There likely was also some extra distance for the river crossings in this part of the valley (Mill, West, Blackstone and Mumford). President Washington clearly wasn't impressed with the road or land from Sherborn to Uxbridge. The next passage shows the President's general annoyance with all the roads in Massachusetts. Probably overstated but by this point in his trip who can blame him for getting cranky. Washington seems to not have heeded his own words about the peoples directions. Someone must have told Washington that the previous days travels from Lexington via Watertown to Holliston was far longer than an alternate route via Waltham. A point on the road from Watertown to Sherburne that is 2 miles from Waltham is Waban (part of Newton). From Watertown to Waban is also about 2 miles making those routes about equal in distance. As Washington stated on the 5th, Lexington is 8 miles from Watertown and on the 6th he says that Lexington to Waltham is 5 miles. This shows that he did travel farther than necessary but only 3 miles farther not the 6 miles he has written. So not only was the original person giving "blind and ignorant" directions the person giving the Waltham version was as well, at least nobody told him "You can't get there from here". It's great the weather turned nice but knowing what is to come this afternoon it's little consolation. Most of what I've learned about the rest of the day's journey comes from sources other than Washington's diary. The President only wrote one run-on sentence about this part of the trip that will appear split into two parts a little later. The beginning and most written about portion of the story takes place in the second sentence of the day's entry, where Washington wrote "Menden 4 more" . The President's misspelling of Mendon is not surprising, listening to a valley Yankee say the name you'd also think it's Menden or Mendin. The story begins at the Ammidon Tavern in downtown Mendon, President Washington definitely passed by this building and from his writing it seems that is all he did. Local legends all say there is more to the story and agree on these details. Washington stopped at the tavern owned by Colonel Philip Ammidon of the Massachusetts Militia (possibly retired) who was a soldier in the Revolution and, the President's party was turned away. The rest of the details vary between sources, I've researched some of the varying details trying to sort the facts from the fiction in the local legends. First up we have the relationship between President Washington and Colonel Ammidon. Most of the local stories don't make any claim of a relationship other than both having been soldiers in the Revolution. However the following claims from two of the local stories deserved a little research. Seeing these extraordinary claims about their relationship I was skeptical, especially of the friendship claim. To find out if either of these claims are plausible I looked for Col. Ammidon in government records and town histories. Philip Ammidon was born in Mendon 4/22/1749, married Silva Taft 11/15/1770 and died 3/19/1802 just short of his 53rd birthday. 4 He was a 25 year old sergeant in the Massachusetts Militia when the alarm came that the British were advancing on Lexington, April 19th 1775. Marching to Roxbury with Capt. John Albee's First Company he served for 9 days and returned home now 26 years old. 5 6 Since General Washington did not come to Cambridge until July, they could not have met at this time. On July 9th 1776 Philip was chosen by his company to be a First Lieutenant in the 1st company of the 3rd Worcester County regiment. He served 25 days on a call to arms at Rhode Island from 12/8/1776 to 1/21/1777. When the urgent call for reinforcements came after the fall of Fort Ticonderoga, Lieutenant Ammidon enlisted in Capt. Peter Penniman's company of Col. Job Cushing's regiment in the Continental Army. They marched to join General Gates in the Saratoga campaign that eventually defeated British General Burgoyne on October 17th. Philip was discharged from the Continental Army November 29th after serving nearly 4 months. On August 27th 1779 he was promoted to Captain and again saw service in Rhode Island from 7/27 to 8/8 1780. 5 None of his service during these years was in places were he would encounter General Washington. However, during this time period Philip Ammidon was active in procuring Continental Army recruits and supplies for the town of Mendon including £25,000 for beef in December 1780. 6 Given his responsibilities it seems possible that his name could have appeared on a logistics report that Washington read. Captain Ammidon served two weeks in Rhode Island at the beginning of March 1781 as part of Colonel Dean's regiment. 5 This time General Washington was present spending a week in Newport and a further two days in Providence opening up the possibility of their meeting. The next reference I find is to Lieutenant Colonel Philip Ammidon of the Third Worcester County Regiment, Col. Benjamin Read Commanding, serving in September and December 1786 during the Shays Rebellion. 6 Being a Lieutenant Colonel on the side of the government during the rebellion could have given Ammidon some recognition in Continental Army reports. I have not found a reference for when Ammidon became a full Colonel, the earliest reference to him as Colonel I've seen is in 1794. 6 With the evidence I've found it clearly is possible that Washington knew of and may even have met Ammidon but, considering how little their paths crossed it seems unlikely that Washington would have considered him an "old army friend". Next I look at the story as told on the "George Washington really stayed in Uxbridge?" web page. In the following excerpt of the legend I have corrected the misspelling of Ammidon which is a very common error in records and histories. There are at least ten variations of the spelling in the references I've read. However for Philip there are only four variations that I've encountered, Amadon, Amidon, Ammidown and the correct spelling Ammidon. Washington's original plan was to stay at the home of Colonel Phillip Ammidon. But when the messenger arrived, and announced that the President was approaching and needed accommodations, Mrs. Ammidon mistook the President for the President of Rhode Island College - a frequent visitor. Not feeling well that evening, she told the messenger to pass on to the next Inn, where better service could be provided. This is a plausible story, I can't find any logical reason to reject the story, although with no supporting evidence it can only be considered a legend. The next versions of events, one by the National Park Service and the other by Bob Haigis are similarly not falsifiable by simple logic and reason. Both of these variations on the tale appear plausible to me however as the National Park Service says they are legends. Next we have two variations of the story as reported by Alice Palladini in an email to the Mendon RootsWeb list. Note: I have corrected some punctuation and spelling in these stories. However when the President and his entourage arrived, on a cold rainy Nov. day, Mr. Ammidon and his daughter were not at home, as they were out buying meat for the anticipated visit of Phillip's old friend, and Pres. of the U.S. George Washington. From here the story varies according to who tells it. Some say a maid opened the door, as Mrs. Ammidon was resting from so much preparation for the President's visit, and the maid when asked if they had the accommodations. She replied "They were expecting someone very important and all the rooms were reserved". shows that the incident the President was writing about was in Uxbridge not Mendon. At the beginning of his diary entry, the mileage tally names a stop in Uxbridge 1 mile from the final destination of Samuel Taft's house. A more plausible reading of this diary entry is that he had stopped at a tavern in Uxbridge about one mile east of Taft's, more on this later. Another problem is the description of the weather, cold and rainy completely contradicts Washington's own account, "the afternoon was bright and pleasant". The final problem I see is the reasonableness of Colonel Ammidon's wife Silva or his household servant turning away George Washington if his visit was anticipated. If Philip knew the President was coming and went with his daughter to buy meat for the President's stay I would expect he told his wife and servants to be expecting Washington's arrival. I feel that while it's possible one of these versions of the legend is true they both seem highly improbable. One or more of the characters in the story would have to be very scatterbrained for these versions to be true. There is a little more to the stories of Washington and Ammidon but it takes place at the end of the trail. So I'm going to describe the trail route before I finish the Mendon legends. About fifty feet west on Route 16, is the first road sign marking the trail. Continuing west another 100 feet there is a mile stone on the south side of Rte. 16 at the corner of Founders' Park. 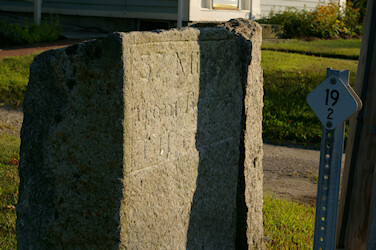 This mile stone was here marking the route of the Middle Post Road when Washington came through Mendon. Following Route 16 (Hastings Street) west, the road passes the Civil War monument, Maple and Washington streets, and the Mendon Driving Range & Miniature Golf (0.45 miles). Here Rte. 16's name changes to Uxbridge Road and a little further along is the second trail sign (0.48 miles). Passing by the Imperial Auto complex, turn right on to Hartford Avenue West (0.83 miles). 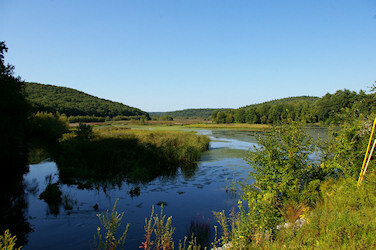 From here the trail winds through the hills and valleys offering scenic views of west Mendon. About a mile and a half down the road, as you descend the western flank of West Hill, you reach the border with Uxbridge where the road name changes to Hartford Avenue East (2.19 miles). At the bottom of West Hill you come to the West River crossing and another trail sign (2.66 miles). Just under a half mile further west is the entrance to the West Hill Dam park and wildlife management area (3.06 miles). In August 1955 Hurricane Connie and Hurricane Diane swept over New England dropping nearly 20 inches of rain and causing the Blackstone River to rise nearly 22 feet. Flooding in the Blackstone River watershed took the lives of ninety people and caused more than 540 million dollars worth of damage. To prevent future disasters the Army Corps of Engineers built this dam on the West River completing it in 1961. West Hill is the largest dam in the valley it's roughly 40 feet tall, 250 feet wide and 2250 feet long (nearly 1/2 mile), it shows up clearly in Google Earth. The Army Corps beautifully maintains this 567 acre site for recreation and wildlife conservation. For the next stop we return to President Washington's diary. Not much for clues here but, Bob Haigis's article gives a possible location for "The house in Uxbridge". I've only found a few other on-line references to this tavern, one is the transportation section of the Wikipedia Uxbridge article. It says there was a "Wood Tavern, at Rice City" on the Middle Post Road. Another is the American Antiquarian Society's page with two photographs of the Wood Tavern. I'm not so sure the Wood Tavern is the one Washington stopped at, his diary says there was only one mile between the Uxbridge stop and Samuel Taft's house. Even using the modern road it is 2 miles from Rice City Pond to Taft's house. It just doesn't seem likely to me that Washington's route tally would be that far off. Earlier I pointed out how there was less than 10% difference between Washington's total and the modern route total. I wouldn't expect 10% accuracy on such a short distance but I would expect to be within 50% (±½ mile). North Uxbridge center is only 2/3rds of a mile from Taft's house, if there was a tavern around there it would fit with Washington's recorded mileage. The Wikipedia Uxbridge article mentions Spring Tavern on the road and I found the following description in Marvin's Worcester history. A recent Uxbridge history book has a photo with this caption, "Spring Tavern located on West Hartford Avenue". 11 Given these descriptions I think Spring Tavern is a better candidate for Washington's "The house in Uxbridge". 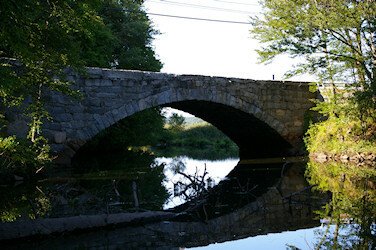 Getting back to the trail's route, the road crosses the Blackstone River (3.84 miles) at Rice City Pond and then crosses the canal on the original stone arch bridge. Just past the bridge on the left is Oak Street (3.92 miles), 2/10ths of a mile down the street is the River Bend Farm Visitor Center of the Blackstone River and Canal Heritage State Park. 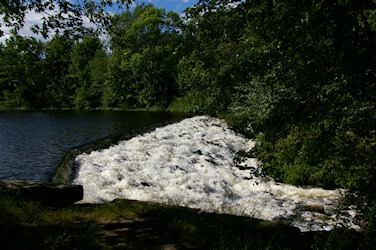 I recommend a side trip to see the beautiful views of the Blackstone River and canal in the park. Beginning just past Oak street is a very steep hill, not named on the USGS topographic map but supposedly named Stage Coach Hill because passengers had to help push the stage coach up the hill. On the other side of the hill is another trail sign and across the road is Peaceful Pond (4.60 miles), a pretty spot to take a break on a park bench. 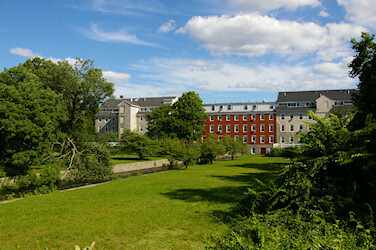 This area of Uxbridge is named Rogerson Village , the road crosses the Mumford River (4.73 miles) offering a good view of the Crown & Eagle Mill complex. 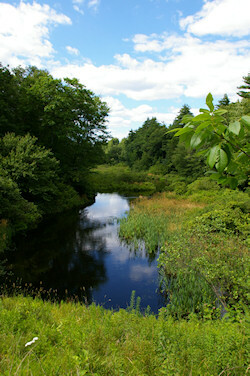 Just west of the Mumford River bridge is a mill pond outlet, between them is a tiny trail that leads to nice vistas of Whitin Pond and its dam. I think Washington felt bad about how critical he was of Samuel's family when they had tried their best to entertain him. He probably also felt he hadn't thanked the Taft girls enough for their hospitality because when he got to Hartford he wrote the following letter to Samuel Taft. Being informed that you have given my name to one of your sons, and called another after Mrs. Washington's family. — and being more over very much pleased with the modest and innocent looks of your two daughters, Patty and Polly I do, for these reasons, send each of these girls a piece of chintz. — and to Patty, who bears the name of Mrs. Washington, and who waited more upon us than Polly did, I send five guineas, with which she may buy herself any little ornaments she may want, or she may dispose of them in any other manner more agreeable to herself. As I do not give these things with a view to have it talked of, or even to its being known, the less there is said about the matter the better you will please me; but, that I may be sure the chintz and money have got safe to hand, let Patty, who I dare say is equal to it, write me a line informing me thereof, directed to "The President of the United States at New York". We know the letter and gifts arrived December 20th because the Washington papers contain the original letter and envelope sent to the President from Mercy Taft. 13 I haven't found a transcription of Mercy's letter and I'm finding it difficult to transcribe but here is what I've deciphered. ... May it please your highness G. Washington Esq. Your sincere & most ob. & most humble ser. 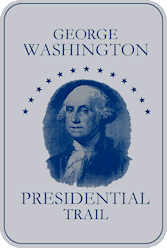 President Washington mentions in his letter a son named for him and another named for Mrs. Washington's family. Those are easy, 6-1/2 year old George Washington Taft and 2 year old Dandridge Taft, I'm not certain why he didn't mention 14 year old Washington Taft, perhaps he had died already but the death wasn't recorded in the town records. Where it gets confusing is when the President refers to the two daughters as Patty and Polly and where he says "Patty, who bears the name of Mrs. Washington". Mrs. Washington was named Martha and George called her Patsy so clearly he is not referring to the name Patty. My guess at what happened is Washington was introduced to the girls as, Mercy who is nicknamed Patty and Parly her younger sister. With a strong Yankee accent Mercy sounds like Marcy to even Yankee ears as shown by the town records that have her recorded as Marcy. To Washington it probably sounded like he was introduced to Martha who is nicknamed Patty and her younger sister Polly. Now that the trail is done it's time to finish up the legends of Col. Ammidon and President Washington. There are two versions presented below, I have no idea if there is any truth to these legends. I hope you've enjoyed this trip down the George Washington Presidential Trail. Feel free to contact me with any comments, complaints, questions or suggestions. 1. Benson John Lossing ed., Diary of Washington : from the first day of October, 1789, to the tenth day of March, 1790 (New York, NY: ? ?, 1858) 43-44. 2. Chapin, Henry., Address delivered at the Unitarian church, in Uxbridge, Mass., in 1864 (Worcester, MA: Press of C. Hamilton, 1881) 40-41. 3. Palladini, Alice. "Re: Ammidon." RootsWeb MA-MENDON List, May 17, 2001. 4. Baldwin, Thomas Williams. Vital records of Mendon, Massachusetts, to the year 1850. (Boston, MA: Wright & Potter printing company, 1920) 23, 238, 447. 5. Massachusetts Office of the Secretary of State. Massachusetts soldiers and sailors of the revolutionary war. A compilation from the archives. Vol. 1. 12 vols. (Boston, MA: Wright and Potter Printing Co., State Printers, 1896) 225, 213. 6. Metcalf, John G. Annals of the town of Mendon, from 1659 to 1880. (Providence, RI: E. L. Freeman, Printers to the state, 1880) 332, 363, 368, 373, 382, 394, 432, 451, 453, 456. 7. "George Washington really stayed in Uxbridge?." 8. National Park Service brochure, Mendon, MA Walking Tour, September 1997. 9. Bob Haigis, "The Tale of Three Taverns" Journeys Magazine, Volume 2, Issue 5, March-April 2006. 10. Marvin, Abijah Perkins. History of Worcester County, Massachusetts, Embracing a Comprehensive History of the County from its first settlement to the present time... Vol. 2. 2 vols. (C. F. Jewett and Co., 1879) 428. 11. Wrona, B. Mae Edwards. Uxbridge. (Arcadia Publishing, 2000) 27. 14. Baldwin, Thomas Williams. Vital records of Uxbridge, Massachusetts, to the year 1850. (Boston, MA: Wright & Potter printing company, 1916) 148-163, 321. If you have any questions, comments or suggestions, contact the webmaster. Except as noted, all the original text, photos, graphics, sound and video on this site are copyright 2000-2014 by Paul Hutchinson and are licensed under a Creative Commons Attribution-NonCommercial-ShareAlike 4.0 License .